Some things will never change... goal-getting and dream planning over coffee this morning! Four and a half years ago, Tangram Wellness was launched as a one-woman fitness company offering personal training and early morning boot camps in Singapore. As an introverted foreigner who had made a drastic career change to a hyper-competitive and highly social occupation, to say that I was petrified would be an understatement. I knew that I wanted to blend physical, emotional and psychological fitness to assist women in rebuilding their lives after a significant setback, but I had no role models or mentors in the field and frankly, no idea how the heck I was going to carry out my vision. About a year after the business was established, I added health coaching to the roster, and trained as a coach in behaviour change as well. Eventually, I dipped a toe into the waters of counselling and became an addiction recovery therapist, then began seeking out “my people”- women who were on a journey out of an eating disorder, addiction or other type of self-sabotage. A presentation on bodybuilding at the co-working space, Woolf Works, became a path forward, when I inadvertently admitted to a group of about thirty lovely strangers that I had struggled with an alcohol use disorder and clinical depression for over a decade. When I went home that night, I felt like I might have made the biggest career mistake in my life by giving voice to this highly personal challenge in a conservative country amidst women who frankly seemed to have it all together. The next day, emails of thanks trickled into my inbox. Shortly thereafter, the calls for coaching started to come in. In 2015, I decided to leave personal training behind and focus solely on my coaching clientele. Business was booming and I knew I’d have to hire someone on to fill my former role. Quite fortuitously, Anna Kwan walked into my life. Her warmth and straightforward sensibility, as well as her passion for all things fitness, won me over. As a business owner and athlete with twelve years of experience, she had another great offer on the table, and I could only hope to be so lucky to work with her. To my shock, she came on board almost immediately, intent on serving new and expectant mothers as a pre- and post-natal fitness coach. That wasn’t my vision for Tangram, but frankly, I didn’t care. I encouraged her to build up her desired clientele and she found rapid success. As we grew, we needed assistance with the administrative side of the business, so I hired on Vanessa as our VA and she kept us ticking forward. I then received a heartfelt email and CV from Yuyan Huang, a coach specializing in hormonal health and fitness for women. Yan’s exuberant energy, coupled with her can-do attitude and experience, convinced me to get her on board. We were on the upswing, and my vision for Tangram began to change. Seeing an opportunity to build a sizeable and multifaceted company, I added yoga to the mix. Less than three years after I’d launched Tangram, we were a team of five leading corporate seminars, workshops, talks, boot camps, classes, and individual coaching, as well as working with the press to increase visibility on physical and mental health issues in Singapore. It was exhilarating- and exhausting! It was also way too much all at once, and chasing opportunity diluted the mission. No ascent is without its tumbles and missteps. 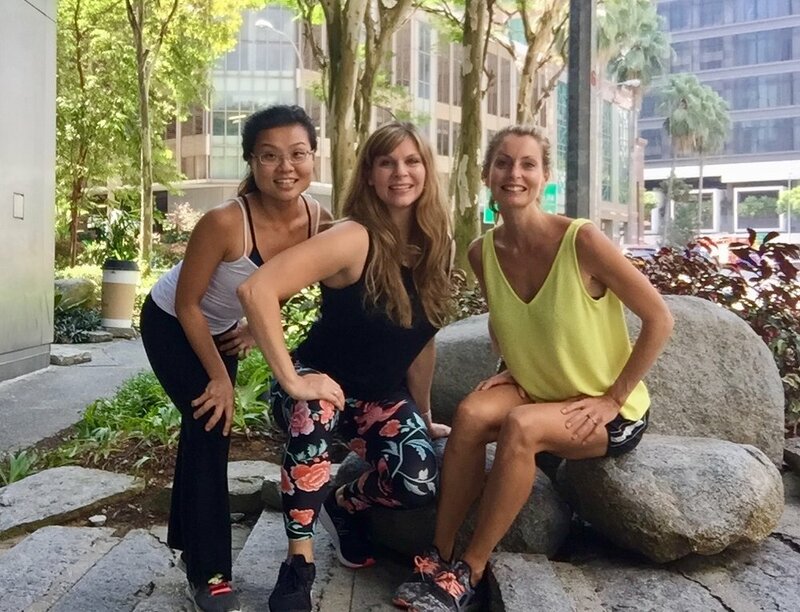 Although we tried our best to make it work, outdoor yoga in sweltering Singapore was just not happening for us (and talk about a bad hair day). After much patience, our yoga instructor Katheryn moved on. Around this time, I was waddling around with a miraculous bun in the oven after years of dealing with endometriosis and the erroneous belief that I couldn't have children naturally. Anna was on her own fertility journey, and soon after I found out I was pregnant, she was blessed as well. Yan readily picked up the slack and helped us both along as we dealt with morning sickness, fatigue and full schedules. At that point, we were no longer just a business. We were family. You may have noticed that we’ve been quite quiet on social media this year. Sometimes mama bears simply need to hunker down, guard their caves, and be with their cubs. Pulling back on work gave us all the space to reflect on what we truly wanted to do with our lives, and the shared joy of motherhood instilled in us the strength to fully come into ourselves and focus on what’s most important— professionally and personally. Thus, it is with a mixture of excitement and sadness that I announce that Tangram Wellness will be ceasing business operations while we commit to do what we do best as individuals. That’s what this journey is about- for all women. It’s about figuring out your gifts and then venturing beyond comfort to share them with the world. It’s about stepping into the dragon’s lair to confront your fears and discover your hidden treasures. That’s a process of not weeks and months, but of many years. It involves lots of preparation, heaps of bravery, many mistakes, some celebration, and at least a few unanticipated detours. And so, we march onward. Anna will be moving on to Beloved Bumps to lead their pre- and post-natal fitness classes and share her knowledge of parenthood with moms-to-be. She is also launching core strengthening classes for moms and their babies, and will begin accepting new clients this month. You can reach out to her directly at anna@belovedbumps.sg or 9230-3141. Yan is focused solely on coaching women who are interested in improving their energy levels and hormonal health through fitness and nutrition, and she’s currently taking on new clients. Get in touch with Yan at lifewithyan@gmail.com or 9834-8147. As for me, I am relishing being a mama while returning full-circle to writing and coaching in behavior change and recovery. I’m also running an accountability group for fellow goal-getters (the current one has commenced; you can email me for details at aimee@tangramwellness.com). Serving “my people” as a coach and writer gives me yet another reason to wake up with gratitude, and since my baby now dictates my calendar, there’s no screwing around with time! The Tangram Wellness website and social media will remain for now, and you’ll be able to contact us at that email address throughout 2017. Through Tangram, I’ve learned more than I ever did in 20 years of schooling while making an impact in the community that I now call home. We’ve all forged incredible connections that will last a lifetime. Most importantly, we’ve had the opportunity to cheer our clients on as they soar in the direction of their goals and dreams, and we will continue that good work. For everyone who has been a part of our lives during Tangram- THANK YOU.